My summer reading plans are always a bit, uh, ambitious, and I don’t usually get anywhere close to completing the list before I get distracted by other books or run out of time. I’ve accepted this. At least when I shoot for the moon, I’m likely to land among the stars. Especially when I’m working and there is always stuff to do around the house, it can be too-tempting to be in the middle of a book when I get bored with a project, like transplanting hostas or demolishing something in the bathroom. I usually just make myself some iced tea and finish my book so I only have one project left incomplete. As you can imagine, this doesn’t always go over well with Aaron at the end of the day. But I am really, really, really grateful to be self-employed and less busy in the summers, and part of that privilege gives me extra household responsibilities on my off days, so in an effort to stave off boredom AND live responsibly, I have been devouring audio books. Other than that, I’m a huge fan of GoodReads to keep track of books I’ve read and get suggestions from people I trust. (The GoodReads site makes it easy – I can tell if I trust someone or not based on their “shelves” and “book ratings.” It will also probably put me on a government watch-list.) 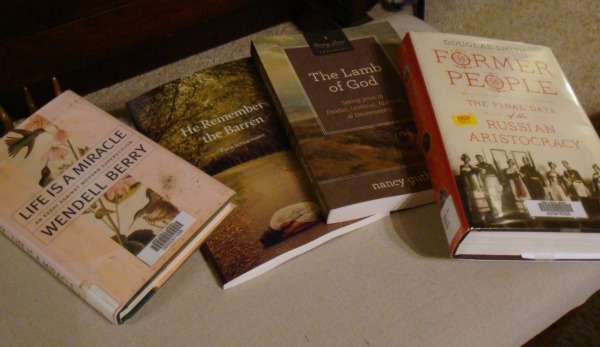 I’m keeping a summer reading list there, and so far I’m working through Nancy Guthrie’s Lamb of God Bible study, some Wendell Berry essays, and a book about the Russian aristocracy right before the Bolshevik revolution. You know, to keep things interesting. I’ve enjoyed your blog and appreciate your insights on many topics. I wanted to share with you why I have never read the Harry Potter books. As you said, you can see why many parents caution their children in reading these books. Well, my Heavenly Parent has cautioned me in reading such books. He wants me to think on whatever is pure, lovely, right, and praiseworthy; therefore, just because I can read them, doesn’t mean I should. It would cause me to think on lesser things. Thanks for letting me share! Glad to hear you are listening to Harry Potter. I’ll have to admit that I started reading these books before I was a Christian (and was pretty obsessed) but re-read and finished the series even as a more “mature” (whatever that means haha) believer. As an adult who was studying scripture alongside reading the books for entertainment, I felt that I was able to discern the things that were un-true, while still appreciating the writing and storyline. I was even amazed at all of the parallels to the gospel and themes that encourage readers to want to overcome evil with good and stand up for the oppressed. I guess in the end, I agree that it isn’t any more “occult” or strange than the Chronicles of Narnia or the Lord of the Rings. The primary difference is that the author isn’t a believer. Also, I think I watch a lot of movies and shows that don’t 100% glorify God. Sooo…I suppose if there is an issue with Harry Potter, to me the bigger issue is entertainment in general…because much of it isn’t completely biblical. BUT, can we watch it in light of the bible and still live in the world? Interesting discussion! I love that you were obsessed… I’m really enjoying them! It’s so interesting that even a non-Christian author can’t get away from gospel parallels in an epic tale. Redemption is the ultimate story. There is no compelling story that doesn’t reflect that in some way, even though the most intentional allegory is going to mess something up. And we’ve absolutely gone back and forth about entertainment standards, too… hard to know how to balance all of that. We didn’t have a TV or reliable internet when I was working and I truly had nothing to talk to my coworkers about because all they did was watch shows and surf the web. I think I missed a lot of opportunities to connect with them because of that. I think a relationship would have been a better witness than what I presented. (Think: Angela in the first few seasons of The Office.) xo!